Lake Tanganyika is Africa’s second largest lake, providing fishing communities from all bordering countries with protein rich fish. Zambia is one of these neighboring countries. 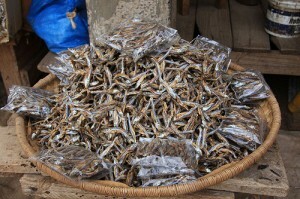 As in other countries, the annual demand for fish increases and local fish population such as Kapenta and Tilapia go down. Now the Scottish fish farm supplier Fusion Marine won a £ o.5m contract to provide expertise and aquaculture equipment for a new Tilapia farming venture in Zambia. Zambia is a landlocked country in Southern Africa. The national territory contains 15 million hectares of water in the form of rivers, lakes and swamps. The largest basins are the Zambezi River, the Luapula and Lake Tanganyika. All these areas are fresh water and are dominated by small-scale artisanal fisheries. The national fish consumption still outstrips the annual production. While the government is aware of the importance of the fishing sector particularly for the rural development and food supply, approximately 300.000 people are supported by fisheries deriving their livelihoods. They are fishers or fish farmers themselves or traders, service providers and processors. Furthermore fishing activities are still mainly carried out by artisanal fishermen (about 30.000) and industrial fishing is limited to Lake Kariba and Lake Tanganyika. With less than 100 industrial producers in the mentioned lakes, industrial catches only account for 15 percent of the total annual production. 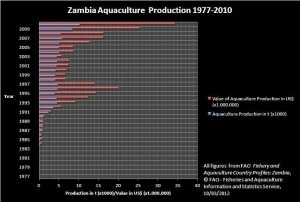 Zambia is a country rich endowed with natural resources that are perfectly made for aquaculture production. 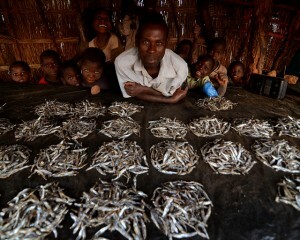 The FAO estimates that about 6.000 small scale farmers currently operate with over 13.000 fish ponds in whole Zambia. 75% of the annual aquaculture production comes from these small scale farmers, while the other 25% come from commercial fish farmer’s produce. 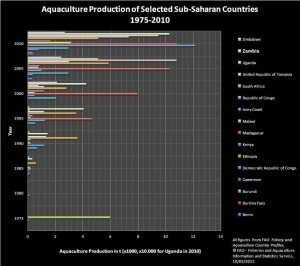 Meanwhile aquaculture is expanding in all nine provinces and with that Zambia is one of the largest aquaculture producers in whole Sub-Saharan Africa. The three fish species mainly used for aquaculture production are the three-spotted bream (Oreochromisandersonii), the Green-headed bream (Oreochromis macrochir), and the Red-breasted bream (Tilapa rendalli). The last mentioned Tilapia will be the supported species for the upcoming fish farms, the Scottish fish farm supplier Fusion Marine is providing. The company will be supplying 18 Aquaflex fish farm pens and technical expertise. Often technical skills such as pond construction are still lacking particularly among the small scale farmers. According to Fusion Marine, the project includes a hatchery for about 10 million tilapia fingerlings. This can be very helpful for local small scale farmers because they often miss enough young tilapias. This broodstock has already been under cultivation for over a year. First fingerlings could be commenced into the pens in the middle of this year. A first produce from these farms is expected early 2013 and in total a production of 1.000 tonnes per year is planned. We are delighted to have secured this contact, which highlights Fusion Marine’s leading expertise in new start-up fish farm developments under very different environmental conditions and on a wide range of fish species. Once the farm is up and running, the biggest challenge for Mpende Fisheries is the distance of the site from the big cities in Zambia where the supporting services are to be found and where the markets for the product lie. The harvest will, therefore, be processed locally and then sent to the major markets in the country. This project will contribute its part to the expansion of the aquaculture sector in Zambia, especially in Zambian waters in Lake Tanganyika. With an additional fish production through such industrial fish farms, the population’s increasing demand for fish proteins can be covered at least to a higher extend.